Who doesn’t love a good soak! It’s the perfect way to unwind, relax, and destress. 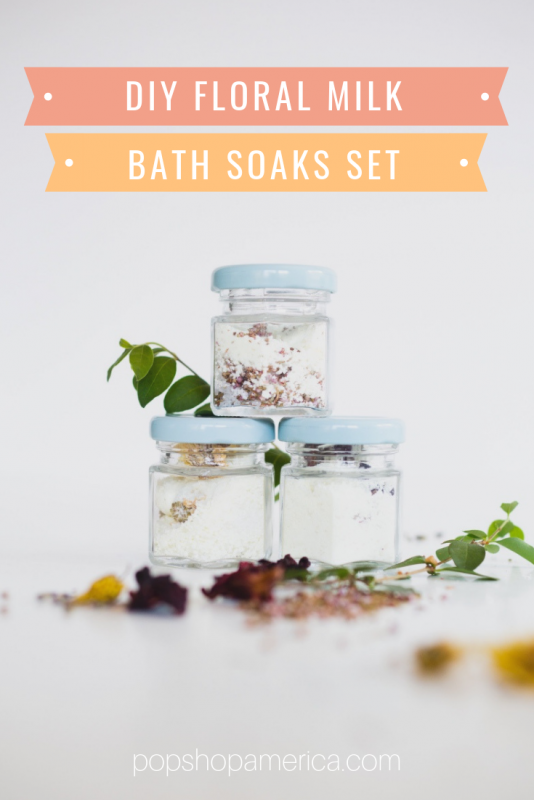 That’s why I made this DIY Floral Milk Bath Soaks Set. 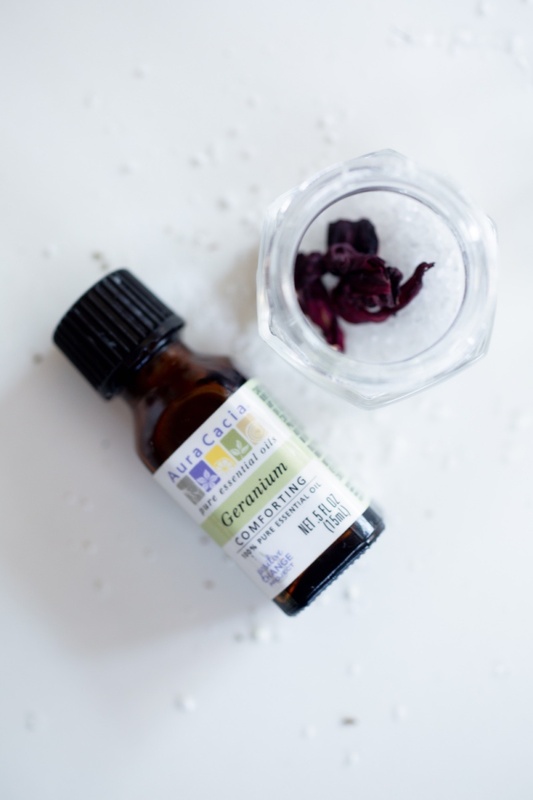 These ingredients are nourishing and will help your skin feel great. They are also remarkably pretty. So pretty in fact that they make a lovely gift! 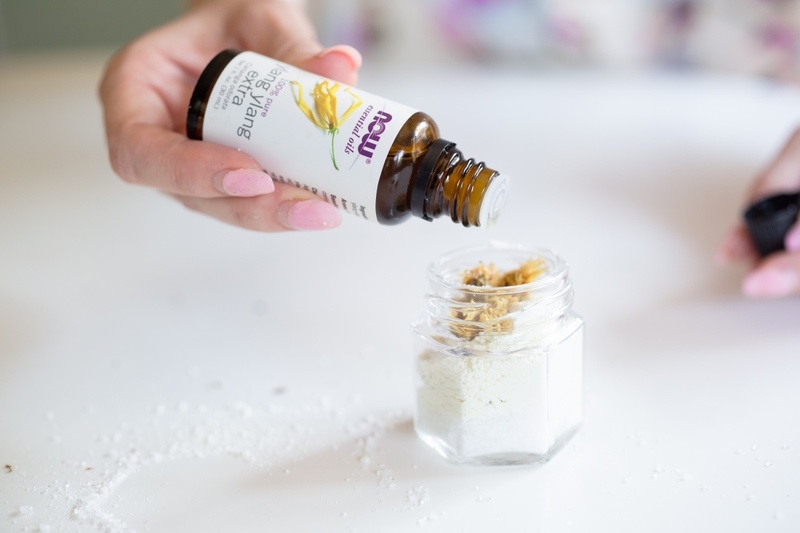 This DIY Floral Milk Bath Soaks Set is the type of bath soak that you could leave in your guest room as a little surprise. Each one is just a little bit different but they all fit together in such a fun way. They are also Etsy perfect and totally sellable beauty products. They just require a few simple materials to make them! 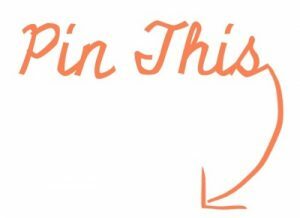 So let’s do it! First prep all your glass jars by making sure they are clean, dry, and remove the lids. 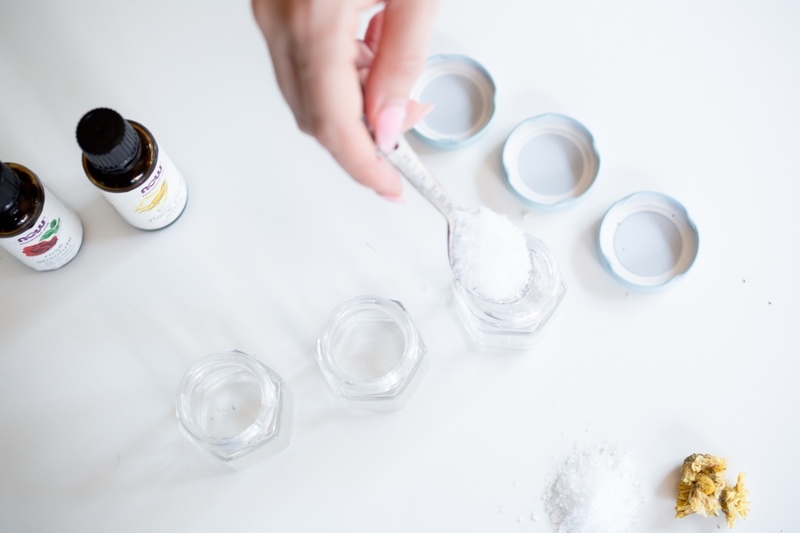 Start by adding your epsom salt to the jars. 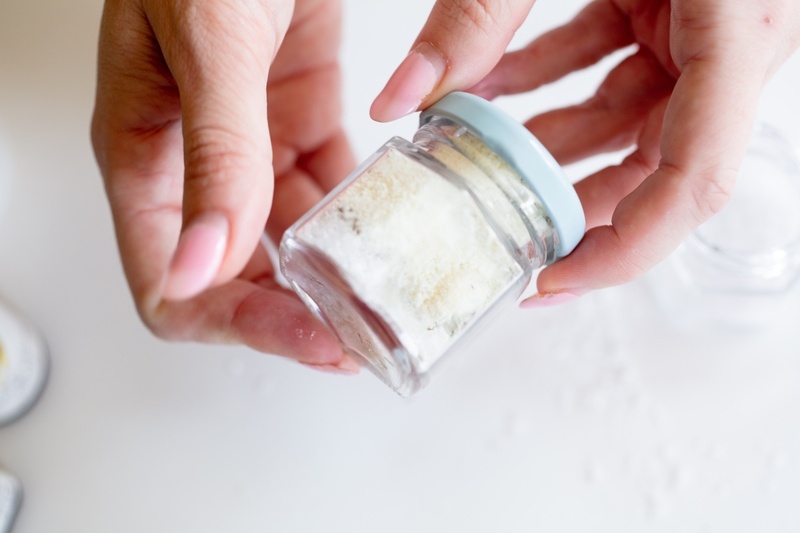 For every 1 part of epsom salt, use 2 parts of powdered milk. 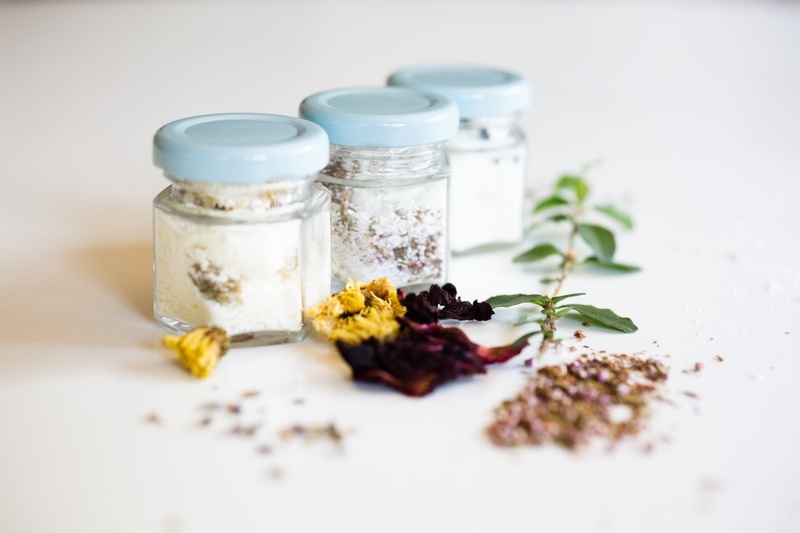 You can make the DIY Floral Milk Bath Soaks Set one at a time or all together. I started with the Rose + Heather Flowers. 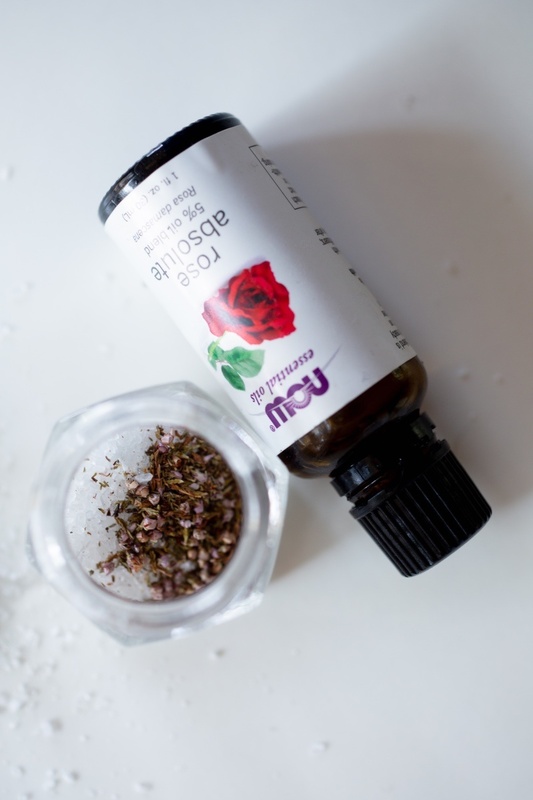 After adding the epsom salt, sprinkle with a sprig of heather flowers. Then spoon in a touch of the powdered milk and give it a little mix. 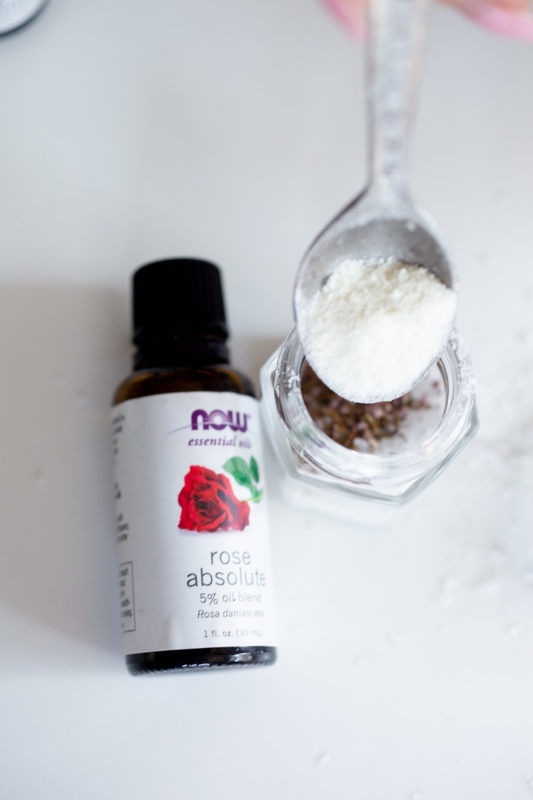 Before the jar is completely full, add your rose essential oil and then top off with powdered milk and epsom salt until full. 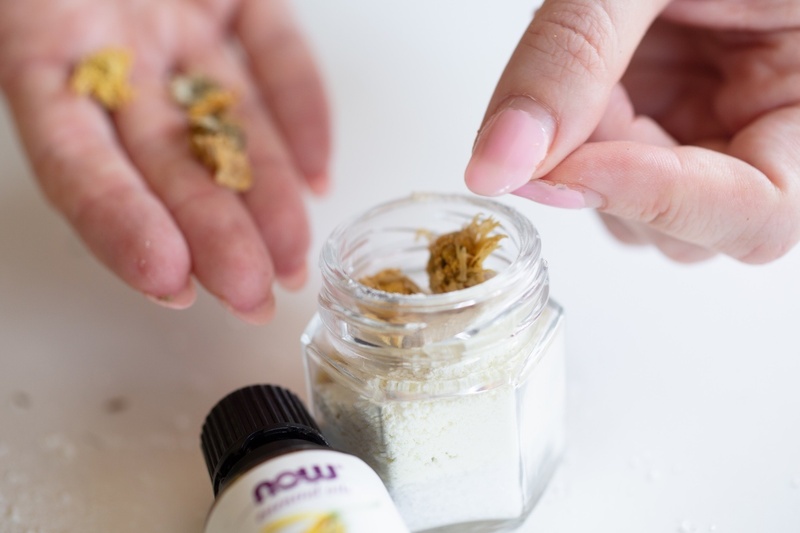 I used tiny jars – so I only needed about 5 drops of essential oil. You can add as much as you would like. If you like it strong, add a lot! If you like something neutral – just add a few drops. 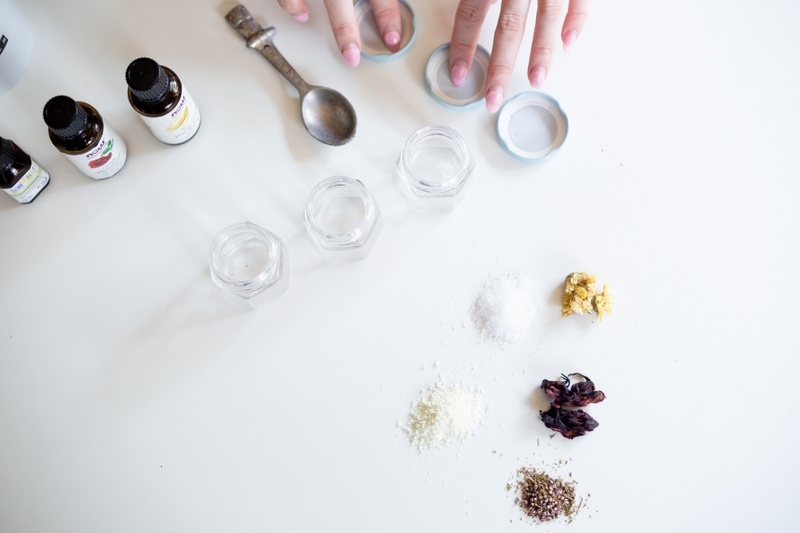 Once all of your ingredients have been added, mix them together by giving the jar a little twist! I repeated that process for the next two scents. First, add 1 part epsom salt. Then add a sprig of dried hibiscus in one. And I added dried chrysanthemum in the other. Next, add just a touch of powdered milk. I added geranium essential oil to the jar with the hibiscus and ylang ylang to the jar with the chrysanthemum. Now, just fill with powdered milk and epsom salt and twist to blend. 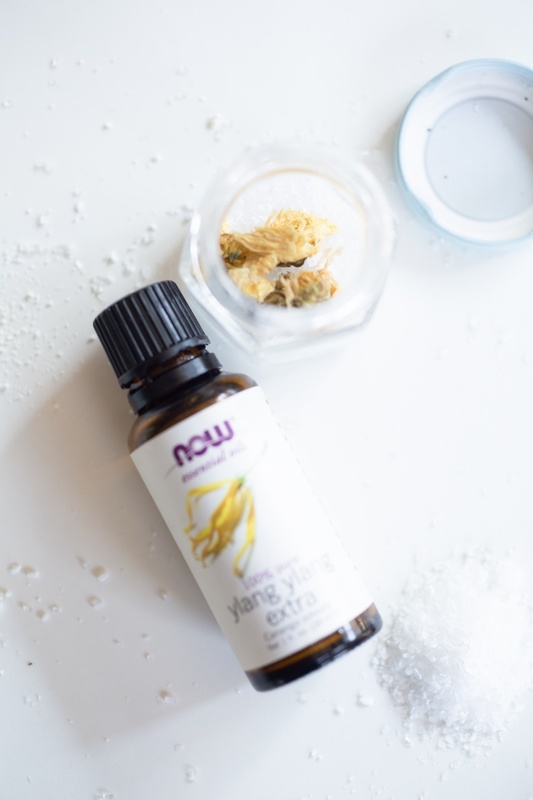 You can even top your jars off with a little extra flowers and essential oils! 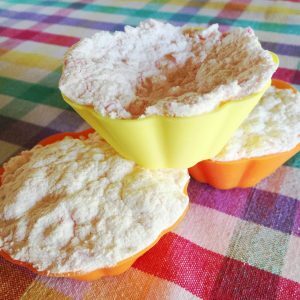 What’s great about this DIY Floral Milk Bath Soaks Set is that the ingredients do not need to be perfect! 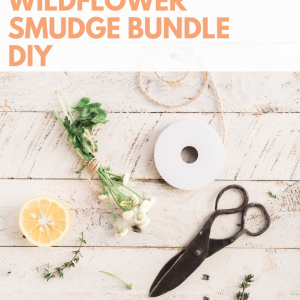 Adding a little extra dried flowers is a great touch to make them so pretty. Milk baths are so relaxing and healing for your skin! Lactic acid provides a gentle exfoliation so your skin will come out nice and smooth. 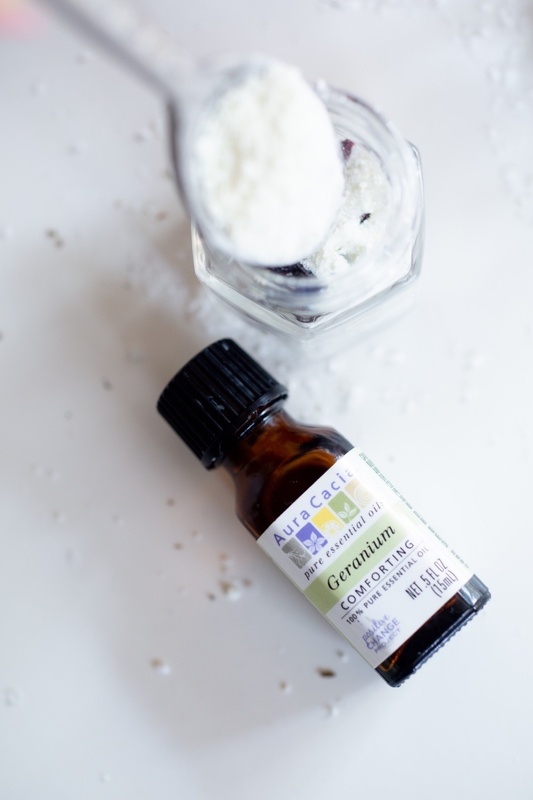 Epsom salt is great for skin health too and helps tired muscles feel great. 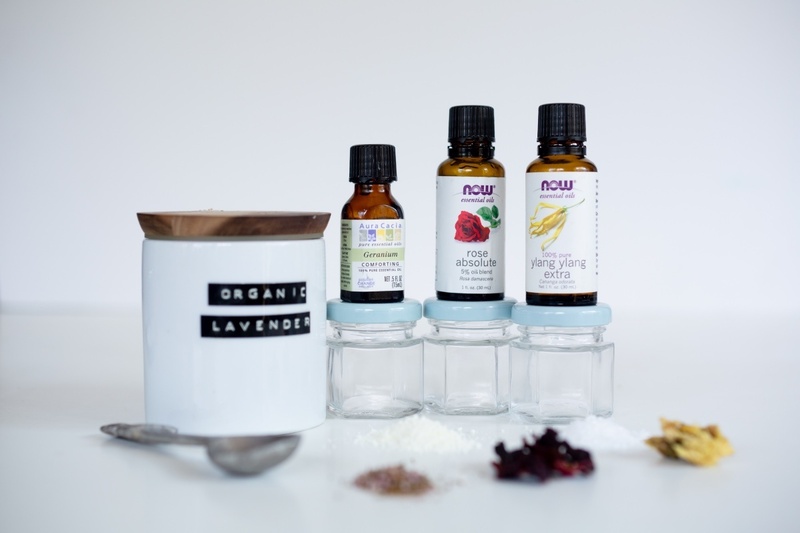 The essential oils have lots of benefits too. 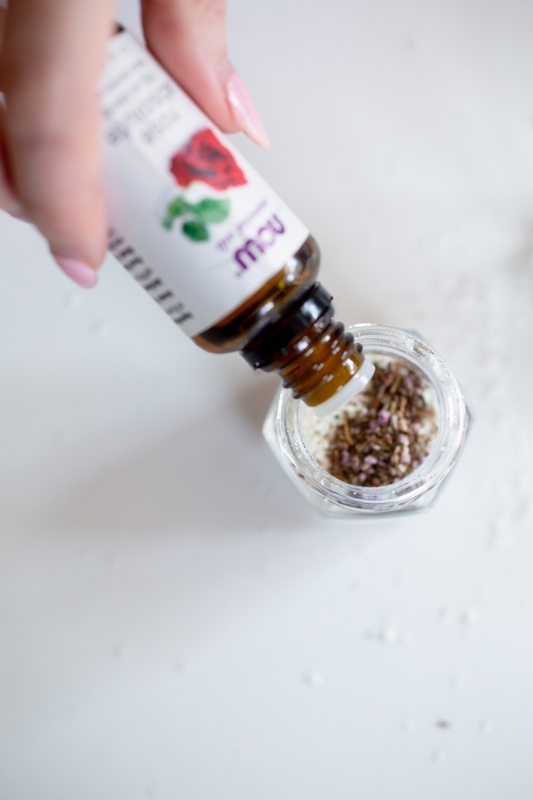 If you just can’t get enough Essential Oil Recipes here are some of my favorites! 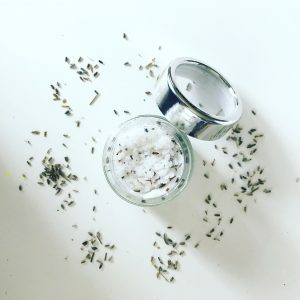 And we made these Bath Soak Recipes into a Pinterest Perfect printable chart! So what are you going to do with your Floral Bath Soaks? Use them yourself or give them as a gift? Tell us what you thought of this recipe in the comments.